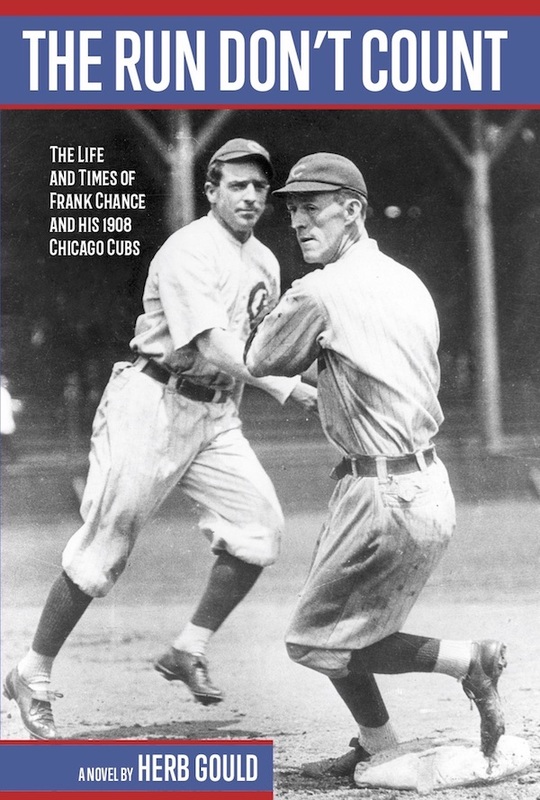 Pleased to announce that my historical novel, The Run Don’t Count: The Life and Times of Frank Chance and His 1908 Chicago Cubs, is now available at Amazon Books. I like to think of it as a living history; at least, it’s a piece of history I would have loved to live through. Until Elon Musk comes up with a Time Machine, researching and writing about the dawn of team sports as a nationwide phenomenon will have to do. This is not a fancy book. True to my tabloid-newspaper roots, I stick to down-to-earth stories told, I hope, in clean plain English. That said, I’m very proud of it. And the people who have checked it out say it’s an entertaining read. 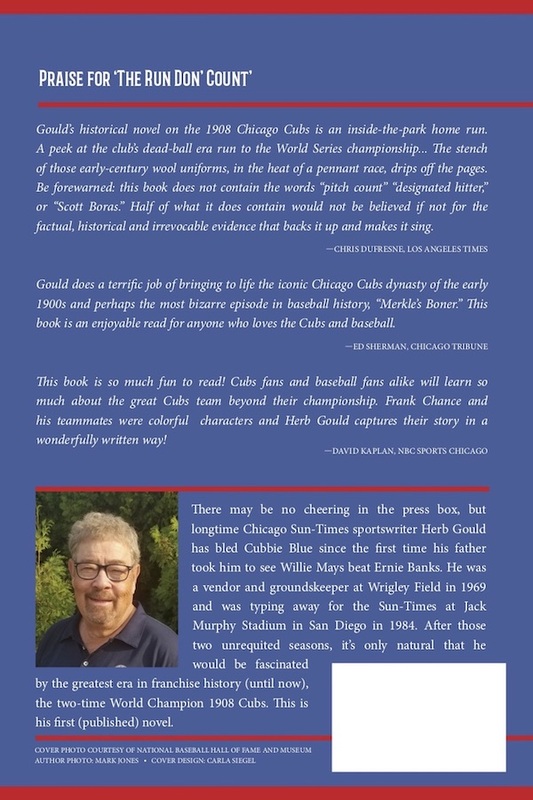 If you’d like to get to know Tinker, Evers and Chance the way modern Cubs fans know Bryant, Baez and Rizzo, I hope you’ll check it out, too. Meanwhile, I’ll be posting some excerpts here from time to time. In the first, narrator/batboy Billy Goetz gets his first look inside the Cubs’ locker room. . .
EXCERPT FROM THE RUN DON’T COUNT. . . .
After Cubs manager Frank Chance hits the work wagon of William Goetz, a carpenter’s son, while driving to the ballpark, Chance brings the teenager to the team clubhouse so the Cubs’ trainer can look him over. Murphy, I would learn, was Cubs owner Charles Webb Murphy. Or “Chubby Charlie,” as he was semi-affectionately known. Chance led me past his Cubs – well, some of them, anyway. They bantered as they put on their uniforms. Some nodded at Frank. Others stared. Still others paid no attention at all. We entered a small side room, which contained a leather-padded medical table, a couple of chairs and all kinds of boxes and equipment. A player was lying on his belly on the table while a man rubbed down his right shoulder. When I looked closely at the player’s right arm dangling in the air, I realized his fingers were all mangled. The index finger was merely a stump. The middle finger was a crooked mass. The pinky was bent at half-staff. And the ring finger didn’t look right, either. A round-faced man with a big smile, he said it gently, in an amusing way. I told him about my run-in with manager Chance. Brown smiled. He had a youthful face that beamed. He was just one of those sunny people. That hand was a mess. When he was five, Brown, who grew up on a farm in southern Indiana, had put his hand into the blades of a feed chopper – just out of curiosity, or so the story went. Most of his right index finger was lost. His middle finger was permanently mangled. And his pinky was rendered useless by nerve damage. A local doctor, who had seen much worse as a Civil War surgeon, patched up the hand as best he could. All in all, a decent job. But a few weeks later, while playing with a pet rabbit, Brown fell on the hand and did more damage. Afraid of the whupping he’d face, he didn’t tell his parents. A brutalized hand like that would have consigned many people to a tough life in a rough-hewn region where men earned their keep by farming or mining. But Brown, who answered to the nickname of Miner after spending time in a coal mine as a teenager, rose above it. When not underground, he indulged in his love of baseball. Thanks to his grotesque hand, he developed a sinkerball that baffled hitters. His bread-and-butter pitch did not tax his arm like a fastball, either. He also perfected his own exercise workout routine that gave him strength and stamina. It looked deceptively simple. Lie on your back, raise your ankles six inches off the ground. Pause. Raise your ankles to 45 degrees. Pause. Feet perpendicular. Pause. Lower your feet to face. Pause. Touch the floor with your feet. Pause. And then he would work his way back to the starting point, stopping again at each position. The pauses could go as high as a 13 count during spring training, when Brown was working himself into shape. Teammates would try to follow along. Few, if any, could keep up. That conditioning, combined with the ease with which he threw many off-speed pitches, meant the 5-foot-10, 175-pound Brown could pitch and pitch – and that’s what he did. I looked it up later. From 1906 to 1911, he averaged nearly 25 wins a season, compiling a record of 148-55. Highlighted by his earned-run average of 1.04 in 1906, the third best in baseball history, Brown posted an ERA below 2.00 each season from 1906 to 1910. Through it all, Brown remained down-to-earth and pleasant – and avoided so many of the problems that afflicted simple ballplayers confronted by the often-wild ride of major-league baseball in those early days. He and his wife never had any children. Maybe that’s why he was especially friendly and outgoing with youngsters. When the trainer was finished working on Brown, the pitcher eased off the table. Bert then helped me sit up on the table. He slowly took a look at my head, kneading and probing for a few minutes. I winced a couple of times when he poked around the bump. I nodded vigorously. You didn’t have to be a wide-eyed baseball kid to be fascinated by what was going on here. Looking back, I suspect that Chance was more comfortable with me because I wasn’t in awe of him or his Cubs. Brown squeezed back into the room for a moment.